AquA AnimaniA » Coupondz » Seasonal » Trees, Grave Blankets, Wreathes, Garland, Poinsettias and Decor! ← Make Your Aquarium a Show Stopper for Christmas! For all you last minute Christmas Tree hunters… We have a dozen left!! 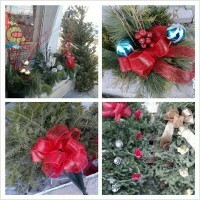 Fresh Trees, Grave Blankets, Wreathes, Garland, Poinsettias! This entry was posted in Coupondz, Seasonal, Uncategorized and tagged Christmas Trees, Garland, Grave Blankets, Outdoor Decor Pots, Poinsettias, Wreathes.